Our third staircase for the same architects on this amazing new build project in the heart of rural Leicestershire on the banks of a stunning water reserve. Here we designed and made one of our signature ebonized ‘Zigzag’ stairs with subtle curved turns, a flared bottom run, and 2 large quarter turn landing to give the whole staircase a grand feel. 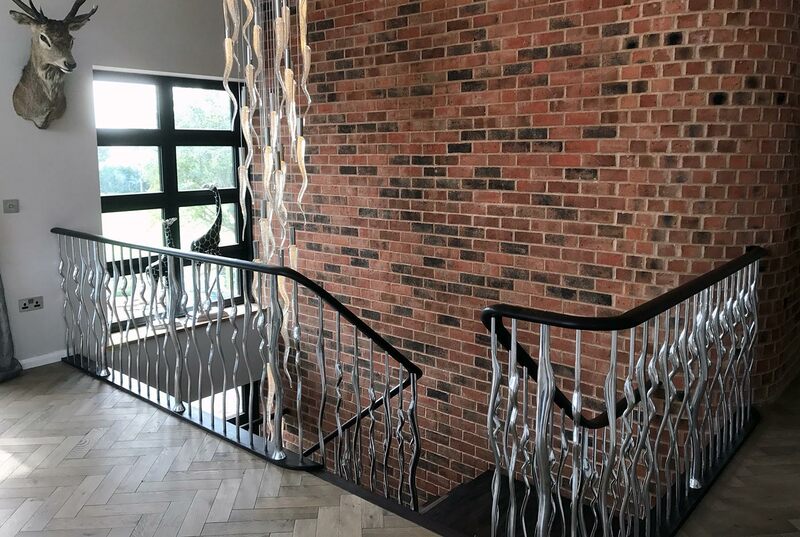 The balustrade was a mixture of ‘Wisp’ and ‘Squiggle’ from our contemporary range of sculptural balustrading all hand cast and polished in solid aluminium, topped off with a beautiful continuous solid oak ebonized oval handrail. Great clients, great job, a great pleasure!